In the summer of 1972, 25-year-old Harry Eugene Walker hitchhiked away from his family’s northern Alabama dairy farm to see America. Nineteen days later he was killed by an endangered grizzly bear in Yellowstone National Park. The ensuing civil trial, brought against the US Department of the Interior for alleged mismanagement of the park’s grizzly population, emerged as a referendum on how America’s most beloved wild places should be conserved. Two of the twentieth century’s greatest wildlife biologists testified—on opposite sides. 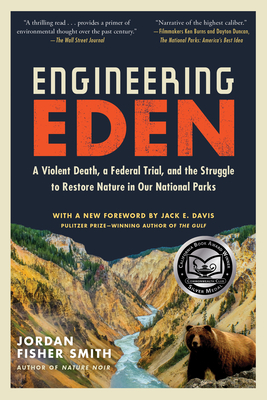 Moving across decades and among Yellowstone, Yosemite, Glacier, and Sequoia National Parks, author and former park ranger Jordan Fisher Smith has crafted an epic, emotionally wrenching account of America’s fraught, century-and-a-half-long attempt to remake Eden—in the name of saving it. Jordan Fisher Smith worked for twenty-one years as a park ranger in California, Wyoming, Idaho, and Alaska. The author of Nature Noir and narrator of the documentary Under Our Skin, he has written for Discover magazine, The New Yorker, Men’s Journal, TIME.com, and many other outlets. Visit him at jordanfishersmith.com. Jack E. Davis won the 2018 Pulitzer Prize for History for The Gulf: The Making of an American Sea.